Instead of the usual holiday treats, employees of McNeil Wilson Communications and Laird Christianson Advertising this season received flu survival kits, healthy snacks and brochures on healthful eating and exercise. David Wilson, principal of McNeil Wilson Communication's public affairs division, said employees were encouraged to get flu shots to prevent illness and "we are also encouraging our employees to employ healthy habits in their everyday living, such as proper nutrition and exercise." He urged employees not to report to work if they become ill. The flu survival kits contain such items as mini hand sanitizers, Emergen-C vitamin packs, vitamin C, mini hand wipes, mini Kleenex packs and brochures on Tamiflu and Airborne products and an informational brochure on flu survival. The Chevron Hawaii Refinery has been recognized for its efforts to protect endangered waterbirds, specifically the Hawaiian stilt and Hawaiian coot. Both the endangered birds are beneficiaries of Chevron's caretaking for the birds on its lands in cooperation with the U.S. Fish and Wildlife Service and state Department of Land and Natural Resources. The two agencies recently approved a six-year Safe Harbor Agreement with Chevron for bird-friendly measures taken at its Campbell Industrial Park refinery. Chevron will manage six acres of stilt nesting habitat and five acres of coot foraging habitat at ponds that are surrounded by storage tanks for petroleum products. From 1993-2003 Chevron worked cooperatively with the wildlife agencies and observed 14 to 51 stilts and up to nine coots mature to flying ability each year at the site. Mililani Complex Schools have received a $30,000 donation from developer Castle & Cooke Homes. The funds will be used to purchase school resource materials, new computers, orchestra instruments and for special student programs. The Elementary Orchestra Program at Mililani 'Ike, the NASA Space Camp, Washington, D.C. Workshop, and Japan-Hawaii Exchange enrichment programs at Mililani Middle School are just some of the programs that will benefit from the donation. » Helber Hastert & Fee, Planners Inc. has hired Leah Rothbaum as office manager. > DHI Mortgage, a subsidiary of D.R. Horton, has hired Laura Bingaman as branch manager. She will be responsible for the day-to-day operations of the entire team of loan officers, processors and closers. She has over 20 years of real estate and managerial experience. » Pacific Guardian Life has appointed Bruce K. Umeda assistant vice president-brokerage sales. He will be responsible for both employee benefits and individual life brokerage sales. He has 30 years of experience as an insurance industry executive. » ResortQuest Hawaii has appointed Charles "Charlie" St. Sure general manager. He will be responsible for the management of the resort and guest services. He has 36 years experience in the travel industry. » Coldwell Banker Pacific Properties has hired Bradley Begonia as marketing service manager. He will be responsible for overseeing the operations of the center. He previously worked at Delta Construction Corp.
» Hawaiian Commercial & Sugar Co. has appointed Kevin Owen manager, power plant operations. He will be responsible for overseeing management of the company's power plant. He previously worked for Georgia Pacific Corp. for eight years. » Bank of the West has hired Roberta Wong Murray as senior vice president of corporate communications. She will be responsible for strategic and tactical planning, development and implementation of internal and external communication activities by the bank. 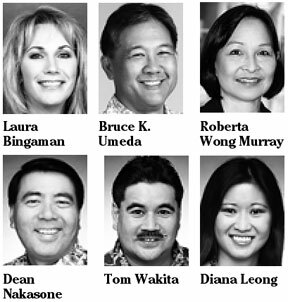 She once served as a KITV television news reporter and anchor. » Ohana Hotels & Resorts has announced the following management changes: Dean Nakasone has been appointed general manager. He will be responsible for all departments of the hotel. Tom Wakita has been promoted to the company's sales and marketing director. He previously served as the company's Hawaii sales director. Pam Yagi has been promoted to the company's Waikiki Beachcomber assistant general manager. Karen Villarmia has been appointed the company's Waikiki West hotel manager. » Atlantis Adventures has promoted Diana Leong to sales representative. She will focus on the westbound travel market. She joined the company in May. » Trex Enterprises has appointed Adm. Thomas B. Fargo has been appointed president. He will continue as chairman of two of Trex's subsidiaries. He previously served as the Navy's Commander of the Pacific. Cisco Systems Inc., the No. 1 maker of equipment that directs Internet traffic, said sales may rise as much as 40 percent over the next few years in India as banks, phone companies and the government spend more on networking. Cisco's India sales, which grew more than 50 percent in the previous two years, rose more than 70 percent in the past two quarters, Rangnath Salgame, president of India and South Asia at Cisco, said in an interview today.